We aim to show you accurate product information. Manufacturers, suppliers and others provide what you see here, and we have not verified it. This Comfort Glow electric log set brings the glow back to your fireplace. This set projects a dancing flame look onto your firebox and produces 4600 BTU's of fan-forced heat as well. Included remote control provides optimum convenience. 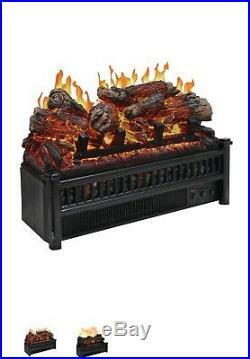 Electric Log Heater with Flame Projection. Real dancing yellow flame look. Flame operates with or without heat. Overall Height - Top to Bottom: 13'. Overall Width - Side to Side: 23'. Overall Depth - Front to Back: 9'. Overall Product Weight: 14 lbs. Warning Text: proposition 65 reasons:This product can expose you to chemicals including 2,2-Bis(bromomethyl)-1,3-propanediol, which is known to the State of California to cause: cancer. California Proposition 65 Warning: This product can expose you to chemicals including 2,2-Bis(bromomethyl)-1,3-propanediol, which is known to the State of California to cause: cancer. The item "Electric Log Heater Insert Realistic Fireplace Portable Space Remote Control" is in sale since Tuesday, December 11, 2018. This item is in the category "Home & Garden\Home Improvement\Heating, Cooling & Air\Fireplaces & Stoves\Decorative Logs, Stone & Glass". The seller is "usa-realdeal" and is located in Jacksonville, Florida. This item can be shipped to United States, Canada, United Kingdom, Denmark, Romania, Slovakia, Bulgaria, Czech republic, Finland, Hungary, Latvia, Lithuania, Malta, Estonia, Australia, Greece, Portugal, Cyprus, Slovenia, Japan, China, Sweden, South Korea, Indonesia, Taiwan, South africa, Thailand, Belgium, France, Hong Kong, Ireland, Netherlands, Poland, Spain, Italy, Germany, Austria, Bahamas, Israel, Mexico, New Zealand, Philippines, Singapore, Switzerland, Norway, Saudi arabia, Ukraine, United arab emirates, Qatar, Kuwait, Bahrain, Croatia, Malaysia, Brazil, Chile, Colombia, Costa rica, Dominican republic, Panama, Trinidad and tobago, Guatemala, El salvador, Honduras, Jamaica, Viet nam, Uruguay, Iceland.